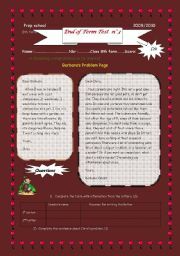 this review contains some tasks related to the 1st term: pocket money, generation gap.. and a writing about school memories. 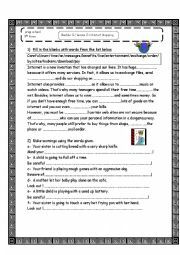 here is a recycling of some lexical items covered in lesson 3 and a task about compound adjectives. this test is composed of two parts: a listening passage ( the script is from esl lab) and a language part dealing with restaurants,biography, net and a function task. 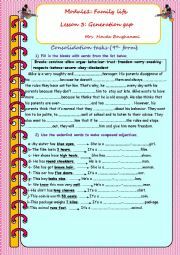 the language tasks deal with the topic of family, pocket money,school. the listening is adapted from esl lab: A day at school. 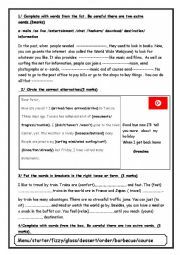 this test contains some language tasks relates to entertainment, means of transport, eating out and the use of the present perfect and the simple past. 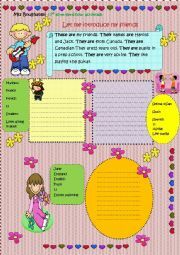 this worksheet contains good tasks of substitution...the students have to make the necessary changes about each person they have to introduce...hope you like it. 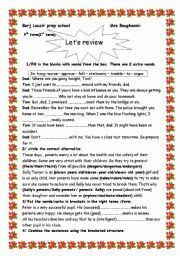 this document consists of e text dealing with children parents relationships. 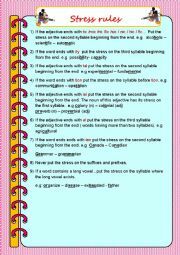 + some useful language tasks+ writing about friendship. 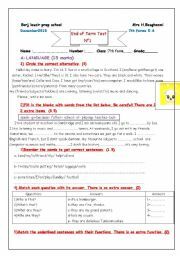 there are 2 parts in this test: language tasks and writing. the pupils have to read a fact file about a girl and then use the information they were given to write a paragraph about her.